Atop a wooded hill above the village of Putney Vermont, on land that he once owned lay the grave of 1/Lt. John Townsend, late of the 4th Company, 2nd Worcester County Regiment of Militia; and, Col. Asa Whitcomb’s 5th Regiment of the Massachusetts Line. John was a veteran of Concord, Bunker Hill, Saratoga, Ticonderoga, and my 4th Great-grandfather on my maternal side. Two of his sons, their wives, and several infant children lay nearby in this overgrown and seemingly overlooked half acre within the Vermont woods. The stone walls that surround the old burying ground are tumbling, and small trees and shrubs have invaded the cemetery grounds now owned by a family that bears no ancestral connection to the land. 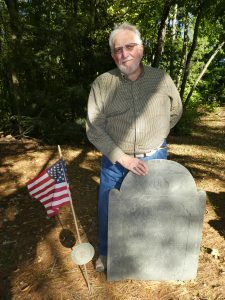 In nearby Bolton, Massachusetts, are the graves of his father Joshua Townsend, two of John’s biological brothers (Richard and Robert) and three of his nephews who also marched to Concord and Cambridge with him in the early morning hours of April 19th, 1775. Joshua was in his seventy-fifth year on the night of, “The Lexington Alarm”, but he shouldered his musket and gamely marched beside his sons and grandsons to face the King’s Grenadiers. Three generations of Townsend’s stood shoulder to shoulder that next day. Through some Divine Providence, all would survive the seven long and arduous years to come. It is my deep regret that my own life’s journeys have not brought me here sooner, to pay my respects to men and boys to whom I owe my very existence, and to whom this nation owes the freedoms that have blessed this land for eight generations. To stand among the graves of better men than myself, was an honor that I had neglected for far too long. So far as I know, I am the first of my lineage to return here since John died in 1827, in the 85th year of his life. I had much to convey unto to him of the nearly two centuries that separate us. For myself, I could only report to him that his male descendants of my own line had tried to do our duties as he set before us with his own; and, have continued to fight in every one of our conflicts since his war that separated us from a foreign tyrant and made us a nation. I could tell him with pride that we had attempted to pass the torch of liberty and freedom that he and his men set alight from each successive generation to the next that has passed through this world from his day to ours. But alas, I could not tell him that, “The shot heard around the world” that he was present to hear, had not been followed by the roar of cannon at Gettysburg, at San Juan Hill, Belieu Wood, Tarawa, Bastogne, and Pork Chop Hill…or as small arms fire in the jungles of Vietnam, the deserts of Iraq and Afghanistan, and at schoolhouses at Columbine, Newtown, and a fairground in Las Vegas. I wish that I might have been able to tell him that the right to own and bear arms that he and his brethren secured for us had not been perverted into a means of killing innocent children, or people enjoying an evening of music on our city streets. I wish that I could have told him that we had not squandered what he bequeathed to us, and that we had built a better world than this…..but alas..